This Interview with Naw A--- describes events occurring in Lu Thaw Township, Hpapun District in April 2015, including arbitrary taxation and community development efforts. The Karen National Union (KNU) has collected 16 kinds of taxes from the villagers in Lu Thaw Township. Naw A--- reported that these taxes are too heavy for the villagers to afford, and that they have been increasing since 2009. At the KNU annual meeting, some villagers asked for a decrease in taxes or at least for the KNU to issue receipts, and the KNU agreed to issue receipts for the taxes they will collect in 2015, as well as retroactively for the taxes collected in 2014. 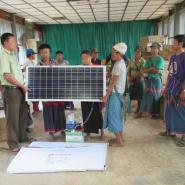 According to Naw A---, Lu Thaw and Dwe Lo townships in Hpapun District received development assistance from the Burma/Myanmar government in the form of solar panels. The KNU allowed the villagers to keep the solar panels, but warned them not to allow this gift from the Burma/Myanmar government affect their political opinions. In 2014, the Burma/Myanmar government also provided eight motorcycles to the KNU. However, the KNU told the villagers that the motorcycles never made it into their custody, as they have been intercepted by alcoholics, who broke the motorcycles before the KNU could get to them. Naw A--- expressed her scepticism of this version of events, as she witnessed a representative of the KNU travel to B--- village in order to receive the motorcycles. The following Interview was conducted by a community member trained by KHRG to monitor local human rights conditions. It was conducted in Hpapun District in April 2015 and is presented below translated exactly as it was received, save for minor edits for clarity and security. This interview was received along with other information from Hpapun District, including 10 other interviews, two situation updates, 301 photographs and 15 video clips. What is your name, Aunty? My name is Naw A---. [I am the] E--- village head [also known as] section C--- [of D--- Town] village head. F--- village tract, Lu Thaw Township. Is it Lu Thaw Township? Yes. Mu Traw [Hpapun] District. What about your responsibility [in the village]? How many years have you been working as village head? Did the villagers elect you or were you selected by people outside [the village]? The villagers elected me. The leaders [Karen National Union (KNU) and Burma/Myanmar government official] also accepted me as village head. I want to quit [now], but they [the villagers] do not allow me [ask me to stay in the role]. What about the Tatmadaw, did they select you? What are the changes that you have seen these days? In the past the situation was really bad, but if we compare it to nowadays it is getting much better. In the past, as I was a village head, I even went to porter. If we bring up our memories [and talk about how the situation was in the past] it can put us at risk because there was DKBA [Democratic Karen Benevolent Army] and also the Tatmadaw [and they still are present today]. In the past there was only one battalion which was battalion #19 but nowadays there are many battalions. Now there is no DKBA [in our region]. Now there are many battalions which are [Light Infantry Battalions (LIB)] #340, #341, #434, #642. Now they do not ask for porters. One time, the [Burma/Myanmar] government [staff] asked us to clean up the district hospital [after it was constructed] but they did not allow us to call it labour work. They asked us to call it “helping”. They will open the district hospital soon. When will they open it? They said they have not decided yet. Are there any development projects conducted in Lu Thaw Township or in your section that you saw [know about]? Since 2012, [people] from a Karen [organisation] have been helping the pregnant women with [new born] babies, for two years: in 2012 and 2013. They have not provided any support in 2014 and 2015, yet. 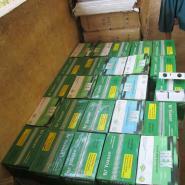 What is the name of the organisation which provided aid in 2013? Karen Women Organization [KWO]. After Karen Women Organization [became active in the area], they [KWO] started collecting the human [individual] tax and house tax [donations]. 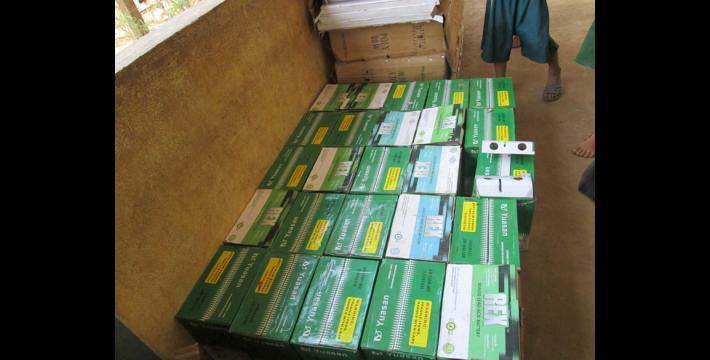 After they collected it, they provided the support [services] for the women. When we went to the [KNU] annual meeting they [KWO] said that if they [villagers] could not afford to pay the tax that’s okay. Are there any problems with the household tax? [There is] no problem because all villagers can pay the tax. 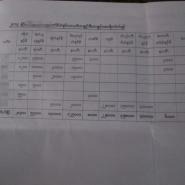 There are 16 kinds of taxes which have been collected by the KNU. Can you tell me the 16 kinds of taxes? So please state [them] for me? As you are village head, do you know if every villager can pay these taxes? Since I started working [as village head] all villagers have paid their taxes. They can all pay it. Have they been collecting [all of] these taxes since you started working? No. In 2006 they [only] collected the elephant tax, farming tax, cultivating tax, and gardening tax. The taxes were increased in 2009 and 2010. Currently, the taxes [also] include the rubber plantation tax. The taxes are increasing. [Since] the taxes have been collected by the KNU, do any of the villagers complain about that? The reason the villagers complain [is] because they collected the tax for the chainsaws at 30,000 kyat (US $23.10). They collected this tax from the [loggers for] logging. As I am a village head, I did not permit the [villagers] to pay the tax because there has been no logging work [for the loggers]. We could not pay [those taxes], therefore the elephant and chainsaw taxes were not paid by the villagers [who live in my section], except for the monks [the villagers who live nearby the monastery]; they did pay the tax, [and they are also] in the same section. Where are the monks living? The monks live in the upper part [of section C---]. Everyone there pays the [chainsaw] taxes? A few of them [villagers in upper section C--- do], but in the area here [lower part of section C---] no one pays that tax. You said they would collect the [chainsaw] tax, has it been collected in early 2015? They started collecting the [chainsaw] tax in 2012 and [continued until] 2014. Did the [villagers] pay the tax in 2012? Yes, they paid, but in 2014 we did not pay the chainsaw tax. They [the KNU] already collected the tax here? They didn’t come for tax collection. They gave us [village heads] receipts and asked us to collect the tax for them. Have they evercome to meet you [to discuss] the tax collection? [KNU] village tract [leaders] and the secretary of [village tract leaders] met with me. Did you tell them why you [villagers] could not pay the tax? They did not allow the [the loggers to do] logging. If they allow logging, we will pay the tax. If they don’t - we are not going to pay the tax. [That is] the reason we paid in the past but did not pay in 2014. So villagers did not complain about the other taxes that they had to pay? They did not complain, but in the annual meeting one Thara Mu who participated in the annual meeting with me, said: “[For] the rubber plantations which are two or three acres in size you demanded 4,000 kyat (US $3.08), but for my rubber plantation there is only one acre [of land] and three or four rubber trees in there, so the tax is a bit high for me. Could you diminish it for me?” But they did not reply anything. You said when Thara Mu raised the tax issue they did not reply to her? She said, “In the past you collected the taxes, but we did not get a receipt from you.” They [the KNU] replied that [this year] they will provide the receipts for [both] the last year  and this year . [She said], “If we get a receipt we would pay the tax [since we will have a guarantee that we will not be asked to pay again]. But [either way] the taxes that you demand are too much for us. If we compare with the taxes demanded by the Burma [government], they demanded only a few kyat.” She said it openly. What about the Burma government, did they collect the taxes? The Burma government collected the tax; [it was] 3,000 baht [kyat] (US $2.31) per motorboat and motorbike. Is it for the whole year? Yes. The Kawthoolei [KNU also] collected 15,000 kyats (US $11.55), and [in addition] they collected 50,000 kyat (US $38.49) for each car. [The] 15,000 kyats (US $11.55) [was] for each motorbike, and each motorboat [was taxed at] 15,000 kyat (US $11.55) [as well]. Based on these [numbers], it is too much for the villagers. As we are village heads, we did not say anything [to the KNU]. We collected the tax for them as we could, but for the villagers who work as missionaries it is very hard for them to afford on that [salary]. Therefore she [one of the missionaries] reported it [to the KNU], but if they don’t diminish it [the tax], we will give it as other people give. What kind of problem [did she have] that made her not be able to afford it [the tax] as a missionary? She could not pay the tax because she gets only 250,000 [kyat] (US $192.43) a year. If she can’t afford it, did she pay the tax in the past? Yes, she always did, but it is too much for her, as she said. She works as a missionary only as a volunteer and has no salary [only a 250,000 kyat (US $192.43) stipend]. Thara Mu G---. She is a volunteer. What kind of missionary work does she do? She is teaching in bible school. How many kinds of taxes have been collected by the Burma government? Is it only the motorboats and motorbikes that they collect the tax on? Are there any other things that they collected tax on? They collected tax on motorboats, motorbikes, gardens [house compounds] and shops. Are they collecting the same amount [of tax on all types of property]? Yes, they collected [tax on] everything at 3,000 kyats (US $2.31) a year, including motorbikes and motorboats. The KNU collected 15,000 kyat (US $11.55) for a motorbike. What about an individual tax? They [Burma/Myanmar government] didn’t collect an individual tax. What about the household tax? 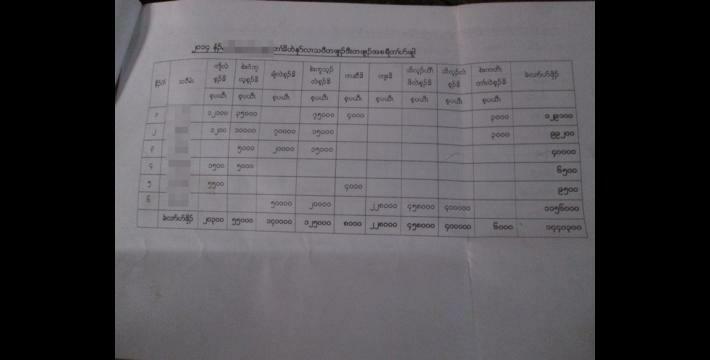 The taxes the KNU collected included an individual, household and garden [house compound] tax. How much did the KNU collect in tax from each household? 1000 kyat (US $0.77) from each household. What kinds of development [projects] have taken place here, and which of them were conducted by the [Burma/Myanmar] government? In here, the [Burma/Myanmar government] parliament conducted the development [projects]. What did the parliament do? They conducted development [projects] such as the road construction, schools and solar panels, which are supported by the [Burma/Myanmar] parliament. You said the parliament provided solar panels, so did they come to distribute it by themselves, or passed it step by step [through other people they’ve delegated the task to?]? Their leaders [Members of Parliament] distributed it by themselves to the villagers and took the picture of the villagers. When did they provide the support [in the form of development projects]? They have provided it from 2013 to 2014 and [they’re also supposed to provide it] in the upcoming years of 2015 and 2016. Aunty, you said they provided the support, so are there any villages [located close to D--- town] that have received the support, such as solar panels? Do you know the name of the H--- village head? Naw I--- [and] the people [also] call her Naw J---. 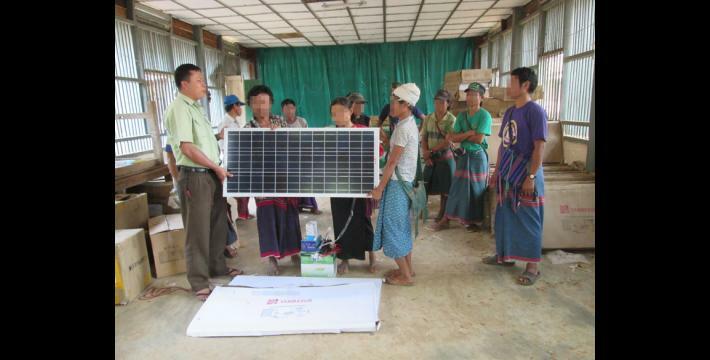 Before they [villagers] took the stuff [solar panels] did anyone from the KNU come to hold a meeting with villagers? They held the meeting in the other side of [Pyeh Loh] river bank. They held a meeting about the land survey. They surveyed the lands. They asked village heads to inform the Burma government in order to survey the lands. We informed them [Burma/Myanmar government]. I also provided the lunch for them [KNU] when they surveyed the land for me. They surveyed all the lands including the farms? Does it include the house compounds? No, only the farms and plantations, such as rubber plantations. A monk also asked me once to go meet him and also conducted an interview as you did. He recorded my voice on a cassette but it did not work well. I told him, “Why didn’t you tell me it didn’t work? If you told me, I would have brought a new one for you. It doesn’t make me feel good [to have been interviewed] with broken cassette [as it was disturbing my interview].” He questioned me starting from my childhood. He asked me when I start going to school; how many standards I have finished; how many years it has been since I dropped out of school; what kind of job I did when I was single; when I got married; how many children I have; how many boys and girls; what the age of my oldest and youngest children is; how long I have been working as village head; what kind of problems I faced. He questioned me about everything. Did he tell you the name of the organisation [he was from]? No. He just said the KNU. How many people [from KNU] came to conduct the interview? Did they come in this year? No. They came in 2013. They questioned me about the kind of problems I faced; the number of villagers [in my village]; which households are poor. We told them everything but we have not gotten any reply from them. Did they tell you where they are from? They are from [the KNU] headquarters. Is the headquarters in Mae Sot [Thailand]? They are from the Mae Sot headquarters. You said they [other KNU members] came to survey the lands, so which township are they from? They are from Lu Thaw Township, Brigade 5 [Hpapun District], and include Kyaw Pgha [from Karen Nation Defence Organisation [KNDO]. His [real] name is Thay Wee Heh. When they surveyed the farms did they also go to survey the lands in K--- [section of D--- Town]? Yes, it included everything. It is [only] a small area here [in section C--- of D--- Town] but in K--- they [village head] did not go to the meeting and they also did not collect the tax from them [villagers in K---, even though they are a larger area]. As I’m a village head, I am not satisfied with this. In 2013 and 2014 we have not seen that they paid the tax, therefore I raised this issue in the meeting. K--- [section] is based in Lu Thaw Township? Yes it is based in Lu Thaw Township. In the past they did pay the tax, but since 2013, [in] 2014 and 2015 they did not pay. They did not pay the tax? Yes. I submitted it to the [KNU] leaders during the meeting and I said, “You did not invite the other side of river bank [K---] village head,” but they told me that the village head was invited by them, but he did not come. [I told the KNU,] “If he did not come you have to improve it [your approach to leading] in the future. If you don’t improve, it I would diminish the support for you,” but they did not agree with me. As village heads we have to work together. Each year in our area, which is called E--- [section C--- of D--- Town], we are supporting them [KNU] with over 10 million kyat (US $7,697.20). In 2014, we supported them with 14 million kyat (US $10,776.08). In this year we gave them over 11 million kyat (US $8,466.92). How many households are there in section C---? Are all of the orphans and widows included [in that count]? Yes. All orphans, widows, Thara, Buddhists, and Christians are included. You said K--- [section] village head did not go to participate in the meeting, so have you met with him to discuss about that? I asked him, but he said that he was not invited by them [KNU]. The KNU said they invited him. In there [K---], households are larger than the households in here. Aunty, you also mentioned the solar panels, so there are three townships in here [Hpapun District], so did any other township get solar panels, for example Lu Thaw, Bu Tho and Dwe Lo townships? Bu Tho [Township] did not get any. What about in the lower part of D--- Town? They all got the solar panels. What about in the upper part, which is in L--- [village]? It didn’t reach there. It reached Meh Wah, Dweh Loh, Pa Tun, Tha Thwee Hta and Klaw Hta [villages]. Did they [villagers] take it [solar panels]? Yes, they did. For me, I think it didn’t cause an impact [in terms of affecting villagers’ political views]. In the last year, I know that motorbikes had been sent by the [Burma/Myanmar] government to Kawthoolei [KNU]. Yes. In the meeting, some of the villagers said that the motorbikes have not been received by the KNU leaders. They were intercepted by the alcoholics and they broke all the bikes. I did not agree with this point [I don’t believe this story]. I told them openly. Which group had supported the KNU, was it the Burma government? Yes, the Burma government. Here, none of the villagers could [financially] support it [motorbikes]. It [the motorbikes] were received by Maung Ku [from KNU]. They [the KNU] went to B--- [village] to take the bikes [that were sent there by the Burma/Myanmar government], but I did not note down the date so I could not argue with them [KNU about the motorbikes]. How many motorbikes did they [Burma/Myanmar government] provide? From what I know, in 2014 they provided eight motorbikes. I have not heard [that] they provided them, yet. I heard about it [the motorbike donation in 2014] from other people and I investigated it by myself. I tell you openly, I am not lying to you. You said it [the motorbikes] were received by Maung Ku, so where did he [Maung Ku] go to take it [motorbikes]? He brought three motorbikes from B--- [village], but I don’t know where they got the rest of the motorbikes from. Where is B--- [village], Is it located nearby? It is based near Meh Way Toh [valley]. Those eight motorbikes were received by the KNU leaders? They [Burma/Myanmar government] sent them out step by step [from one location to another] so I am not certain if they got them or not. In the meeting I heard some villager say that the bikes only reached alcoholics [villagers] and they broke them already. If they [the KNU] did not [want to] accept them, why didn’t they return them back [to the Burma/Myanmar government instead of coming up with this story]? The villagers got the solar panels, so do any leaders protest it? The [KNU] governor Kler Say said, “You [villagers] have already taken it [the solar panels], so you can have it.” Since he said take it, all people [villagers] wanted to get it. Now if you go to Klaw Hta [village], the village is bright with light. Their leader went to meet [Hpapun District KNU administrator] Hpuh Kaw [in order to get permission to accept the solar panels]. If KNU do not allow the villagers to accept it [the solar panels] will they come to hold a meeting with villagers? Are there any organisations that came to do development in section C--- and other places? I have not heard of it. Only Ka La Pa, Kyin Let Village Area Development. They help villagers who are not able to earn a living and destitute people. They are from the Burma government, not from Kawthoolei [KNU]. How many years have they been active here? They were active in 2013, 2014 [and] even in 2012. No, it is not an NGO. What kind of support did they provide? They provided pigs, chickens and goats to the villagers who were not able to earn a living. Even nowadays, they ask us to submit the number of people who need it [support]. We submitted the numbers of villagers who are missing a limb [amputees] and we asked them [villagers] what they need. If they need goats - we apply for it [on their behalf]. If they need chickens - we apply for them. They [Ka La Pa] help them. In our area, the development such as schools, roads, and monasteries, we apply for it and they [Ka La Pa] give us money. We arranged it [the construction] by ourselves. Do you know the names of any leaders [in that group]? [They are] from parliament. U Thein Sein is the leader. What about the people who are active in Hpapun area? State minister and division minister. Yes. The state minister’s name is U Htin Aye and the division minister’s name is Htin Maung. Yes, [and they also have] a minister of parliament U Win Tin. You said they provided support to the villagers, so did they provide it in each section? Yes, they provided it in each section [of D--- Town] and also in villages [near D--- Town]. Did they provide the support to each household? No. Only for the villagers who could not earn a living. So currently some of them already got it? So for the villagers who did not get support, what did they say? They did not say anything in my area. They are fine. Some villagers got it but some villagers did not get it because they are able to earn a living. If they are not able to earn a living we can help them. What do you want to ask me next? Are they [Ka La Pa] helping them with money? How much money do they donate to each person and household? If they [villagers] want to raise two pigs, they donate 1 million kyat (US $769.72). If it is for [buying] a goat they donate 50,000 kyat (US $38.49). The other organisations are NGOs and they also will support the villagers who are not able to earn a living. The NGOs have been operating and supporting the villagers. They started operating on June 9th 2014. The have been working for nearly a year. They conducted a meeting and for the villagers who participated in the meeting they donated 1,500 kyat (US $1.15) to each participant. They held the meeting in my house and we provided snacks and juice to them [participants]. After the meeting was done they calculated the price [of] what we provided. They provided it every time [we had a meeting at my house]. Now they are [in the middle of] conducting a 10-day workshop. What is the title [name] of this organisation? When did they start to operate in here? Did they do workshops in other villages? Yes, they did it in every [many] villages. Did you hear of any problems occurring? No, we do not have any problem with [the Burma/Myanmar] government but we do have problem with Karen people [KNU]. Didn’t the KNU give permission [to get the aid]? They [KNU] said, “They [Burma/Myanmar government] cleaned your ears with a feather dipped in sesame oil [try to coax you into supporting them]”. They said Karen people have to know they are Karen. I told them that we know we are Karen but we are living inside [mixed control area]; you should understand us. A village should have a leader. If there is no leader, there is a dead village [the village would cease to exist]. We [villagers, the KNU and Burma/Myanmar government] have our hands joined [by living in a mixed-control area, so we must] work together. The former village heads never participated in outside meetings [held by the KNU]. Even my sister, she had worked as village head for 20 years but she never participated in outside meetings. I’m the one who participates in outside meetings. Based on what you shared with the leaders, how did they reply to you? They said, “You are living inside [mixed control area]. If people are black you also should be black and if people are white you also should be white [you should adapt to your environment].” They just told me that. I said, “If it affects your organisation, you can let me know.” It offended them when I spoke to them in the meeting. When did you have the meeting [with the KNU], was it in early 2015 or last year? They held the meeting on March 9th 2015. We were invited by them. So all the village heads were present in the meeting? No, only [one village heads] from Baw Thay [Hta] village tract, and the village head from the other side of river [K---] and I were invited, but only I attended the meeting. In [the past] three or four years the village head of the other side of the river never participated in the meetings. What did they say during the meeting? It was called an annual meeting. Each household and village [has to] help the [Karen National Liberation Army (KNLA)] front line military with food, and they registered the names of villagers [who provided food]. They also changed and recruited the new leaders. It’s nothing special that could affect us. You said you have offended them during the meeting, so can you tell me what did you tell them? How many of you participated in meeting? Almost 20 of us participated in the meeting. Did they talk about any other special issues? Where did they hold the meeting? They held the meeting in their new barracks. It is located in Ta Roo Kwee [place]. It’s not in Day Poo Noh [village]? They are Governor Kyay Baw, Governor Kyee Baw [from the KNU] and [some] other [people] but I don’t remember the other [people’s] names. I noted down their names in my book, though. Are there any other NGOs active in Hpapun area, [aside from the one] you mentioned, Help Age International? Help Age International and then NRC. This group is working on the ID card process. Do you know what NRC stands for? When did they [NRC] start processing ID [Burma/Myanmar National Registration] cards? It started in 2013, 2014 and 2015. We could not even count [all the places they live in] because even though [some] people [refugees] live in third country, [they] also came back [to have an ID card issued] and did it secretly [without the NRC finding out they have been resettled]. No, I want to know where they [NRC staff] are from. They are from Hpa-an, Mawlamyine and Yangon towns. Most of them are Karen and they are Christian, Buddhist and Pwo. Do you know their director? U Than Sein is [the director at the] District [level], Township [level director] is Tin Zaw Myit. Do they process it [IDs] in every year? 2016 will be coming soon, therefore they would finish the free ID processing in June 2015. They provided a free ID card for everyone who came to do it. They would be ending this process in June. So will they stop processing it next year? No. They will only stop processing free ID cards in the coming years [and people who wish to have an ID issued will have to pay a fee in the future]. They would not continue it? I do not know [about] other organisations. Are there any organisations from KNU, as you mentioned KCCSC [Karen Communication Cooperation and Supporting Community, prior to the interview]? The KCCSC asked us to collect the donations of rice [from the villagers] and they said if you work on [implementing this project], you will get to know the result from it [you will be able to enjoy the fruit of your labour], but I have not started [collecting rice donations] yet. When did they [KCCSC] come here? They came here twice already on March 16th and February 29th . They never came [in previous years]. Who is the leader [of KCCSC]? Before they came here did they hold a meeting with the villagers? Yes, they held it in the monastery. What did they say in the meeting? They said, “Villagers should act maturely about collecting the rice donations for the [social] development. After collecting it, you village heads should donate it to the destitute people [in your village] and don’t only help them, you can even find young people [to help implement the rice donations].” They said, “As you are the village head, you should organise this process.” They also gave us a list to register the names of villagers [who donate rice]. Now the registration tables were given to Thara Eh Doh’s wife. I have not organised it [rice donations] for her, therefore she could not do anything yet. After the meeting, they dressed us up in Karen shirts and we took a picture together. Are any villagers actively [working] on that [collecting rice donations]? If we organized it, they would have to actively [work] on that. Now [currently] you have not started yet? No, because I am not free. This organisation comes here [on a] monthly or annual [basis]? They came here in March and June, but they didn’t come in April. If they had come in April, we would have organised the process after that [their visit]. We would be actively [working] on that, but currently we have not done anything, yet. If they come [again] they might scold us, but if they scold us we wouldn’t say anything. Did the [rest of the] villagers like [allow] them [villagers who volunteered for the project] to collect donation of rice? Yes, they like it. My villagers did not say [complain about] anything; they even support us. The decision is in our hands. Did you hear of any groups that are going to come to conduct development [projects]? The monk always says that. So you heard it from the monk? Have you ever heard that the Tatmadaw, Burma government, or the people who are working in the towns will organize to implement something [any projects]? We have not heard anything yet. [Did you hear about] the implementation [of any projects] regarding the unity of the [Karen] group of people? I forgot the name of that group but they are Karen people. It didn’t impact the political situation. Before they came here, they asked permission from the monk and the Burma government. They were given permission by Burma government and the monk. But some villagers in D--- [Town] didn’t dare to permit them [to come in to their villages]. In my own point of view, I wasn’t afraid [of] anything. I can accept everything [any scenario]. Do you know what project they will conduct? From what I know, they would provide 200 invitation letters [to a convention] for only [S’gaw] Karen and Pwo [Karen] people. I think they will discuss about the 2008 constitution for the election and they will give some suggestions. It is what I think. Do you know the people who monitor [direct] this group? Htoo Ber Hkoo, Thara Than Tun, U Shway Maung, Shway Manug Sein from Pwo, and Mah Sein Khaung. They are Pwo and S’gaw Karen. Where did they conduct the meeting? In Pgya Htoo [golden monastery]. Did they give any invitations to you? No they did not give it to anybody because [Burma/Myanmar] Governor Buh Thaw did not agree [allow] them. Since the governor did not allow [them to come into the village], as we are village heads, we could not allow them, either. You said Governor Buh Thaw didn’t dare to allow them [to come in]. Why he did not allow them? He is afraid because of our situation in the past. When the DKBA was there, if something occurred it caused problems for us. Therefore he was worried about that. Hpuh Kaw wrote a letter to [Tatmadaw] Operations Commander G3 in December and asked him [Governor Buh Thaw] to give this letter to the [Tatmadaw operations] commander but he [Governor Buh Thaw] dared not. I came back from a meeting [I was attending] and went to give this letter the commander. He [Governor Buh Thaw] is afraid of them because in order to construct the road the commander [Tatmadaw G3] wrote a letter to Hpuh Kaw asking for permission to construct the road from Hpapun [Town] to Hkaw Poo [village tract]. Hpuh Kaw replied to him with permission. Now [the Tatmadaw] Operations Commander already relocated and the new Operations Commander is coming. What about the former one? At the end of March . Thanks very much, but I want to tell you when the [people] from [the KNU] headquarters conducted the interview with me and asked, “What problems regarding health did you face as a village head?” I told them my eyes are sore. I asked for medicine from them but I am still waiting for the result [the outcome of my request]. I did not get any answer from them. Now we [I] feel very disappointed. Are the people [who would provide medicine for you the same people] who conducted the interview with you? Yes they said they would send it [the medicine] for me soon. They said it in 2012 and have not sent it yet, as of 2015. You said you want to resign from the [censor for security] village head [position] and you were not allowed. Why weren’t you allowed? Because the villagers did not allow me to quit. If they get a new village head they do not know what kind of village head will be elected and they even come to me and cry. The old people [in the village] will be gone and the new people will come so if you are a village head you need to be confident to work with two different groups [Tatmadaw and KNU]. You have to speak very effectively, but you get to know the ‘taste of the job’. I know it because I have experience. When in 2007 and 2008 my husband was arrested by the DKBA, I met with them and even though they wanted to hit me I was able to resolve it. The people who wanted to hurt me - all of them are dead already. I was questioning you about your area and villagers’ situation. If I missed something or have not questioned you [about it], can [you] add more? The villagers are working on cultivating [hill fields] and farming [flat fields]. What about other problems which have been faced by the villagers? What kind of problems? If you question me I can tell you. Any problems villagers experienced but I have not questioned you about yet. From what you know? Some villagers became amputees because of landmines. I submitted the number of [amputee] villagers in 2012 but they have not replied anything. You submitted it to the KNU? Yes we have been waiting for them [to reply] until now. What did they say before they asked for the number of people who are amputees? They said they would help them. We have been waiting for them for a long time, even our hair became white and our teeth fell out. You did not get any reply from them? No. The Burma government provided it [prosthetics] every year. They also provided the travelling fee for the villagers [who went to fetch the prosthetics]. I told you openly. The term Kawthoolei (or Kaw Thoo Lei) refers to Karen State as demarcated by the Karen National Union (KNU), but the exact meaning and etymology is disputed; see: Jonathan Falla. True Love and Bartholomew: Rebels on the Burmese Border, Cambridge University Press: 1991. All conversion estimates for the kyat in this report are based on the January 19th 2016 official market rate of 1,298.80 kyat to the US $1. Thara (male) or Thara Mu (female) is a Karen term used for any teacher, pastor, or any person to whom one wishes to show respect. It appears the interviewee misunderstood the question or chose not to directly answer the question but rather change the subject from the solar panels to the land survey. Kyaw Pya used to be a KNDO commander, but has retired. Thara (male) or tharamu (female) is a Karen term used for any teacher, pastor, or any person to whom one wishes to show respect. From previous reports from Hpapun District, KHRG is aware that the Norwegian Refugee Council (NRC) operates in the area. An Operations Commander (G3) is responsible for planning, strategy and training officers. Also known as strategic / Tactical Commander. Although the interviewee mentions the trouble that DKBA used to cause them in the area in the past, and then continues to talk of a recent case involving the Tatmadaw and KNU, both statements are meant to illustrate that due to the history of armed-group conflict in the region, Governor Buh That has become a very cautious man and does not wish to trigger more conflict, as he has to work both with the KNU and the Tatmadaw. This cautiousness, according to Naw A---, is the reason he did not permit the Karen convention representatives to come into the village. According to Naw A---, Governor Buh Thaw was afraid because, as a governor, he tries to maintain neutrality between the Tatmadaw and the KNU, collaborating with both. He did not dare to deliver the letter in question because he was not sure what the contents of the letter were, and he feared that if the receiver does not like it, his relationship with them may become strained.